Japanese millionairess Chisako Kakehi was arrested on November 19 on suspicion of poisoning her husband with cyanide in Japan’s latest apparent “black widow” case. It also emerged that six of her former partners had already died. 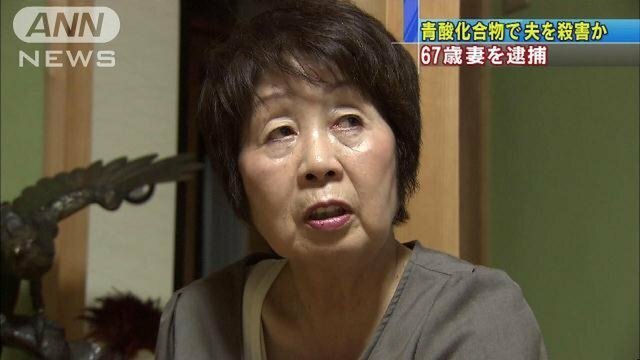 Chisako Kakehi, 67, has been the beneficiary of a combined 800 million yen ($6.8 million) over the last two decades, insurance money and other assets she received after the seven men’s deaths, Jiji Press reported. Husband No 4, Isao Kakehi, fell sick suddenly at home and was confirmed dead at a hospital in December 2013, less than two months after the couple married. That came after the September death of a 75-year-old boyfriend, who fell suddenly ill after the couple ate together at a restaurant, Jiji reported. Chisako Kakehi’s dalliance with death began in 1994 when her first husband passed away at the age of 54. In 2006, her second husband, whom she had met through a dating agency, died of a stroke aged 69, while the third marriage ended in 2008 with the death of her 75-year-old partner, Jiji said. A boyfriend, believed to have been suffering from some form of cancer, died a year later, and in 2012 her then-fiancé met his fate after collapsing while riding a motorbike. Traces of cyanide were detected in his body, media reports said. Chisako Kakehi was arrested Wednesday by police in Kyoto on suspicion of murdering her latest husband. She has denied any involvement in his death. Police are now working on the theory that she could have been behind the deaths of at least some of the other six. Questioned by reporters earlier this year, former bank worker Chisako Kakehi protested her innocence. “If people suspect murder, I’d find it easier to bite my tongue off and die,” she told reporters in March. Jiji Press quoted Chisako Kakehi as saying in an earlier interview that she was “doomed by fate” to suffer a series of deaths among those close to her, and protesting that she had no access to poison. If she is found to have been involved in the deaths of numerous partners, Chisako Kakehi will become the latest example in Japan of a “black widow”, named for the female spider that devours its mate after coupling.